While most of my friends went to see KPOP artist 2ne1 and had gone hippie happy at the Wanderland concert last night, I (with mom and brother) went to Robinson's Magnolia to see the Side A Band for the Robinson's Malls Music Festival launch. It is one of the few, rare events where I can bring a plus one, and I decided to bring my family (my mom actually as my date), and I am glad that she also enjoyed the night. She even mentioned that she remembers Side A is my sister's favorite OPM band. I was still a kid then, but I do know most of their songs (as a kid, we usually get our musical influences from our siblings and parents). I sure remember the Side A band's albums - in plain white and blue covers. It is a real treat for shoppers, and it is a good move for Robinson's Malls to support our OPM artists. Click Read More to see more snapshots from the mini-concert..
We even got a treat from Fireflies who did a hulla-hoop and fire dance performances. Then, finally, we heard the beat of the drums and strums from the guitar, Side A band was ready for the night! It was amazing to see that there were people singing along with the band (and these are young adults who probably were not born yet when Side A was formed!). Just goes to show, good music will stay. even people from the mall started watching the free concert. What I love about the mini-concert last night was how intimate it was! Joey even came closer to the audience and gave chance for some to sing along with him. Others took the chance to have a #selfie with Joey! I equally love how "cultured" the audience was! They were not threatening and they respect the artists' space and performance. Most were also in to the music and performance - clapping, and swaying along with the band - showing how much they love the show (my mom included! I love how she enjoyed the night!). I honestly hate it when the audience do not give much appreciation to the artists. So when Side A asked the audience to stand up and join them, I knew it was the start of the happier moments of the night. Look at how close people could get to the band! 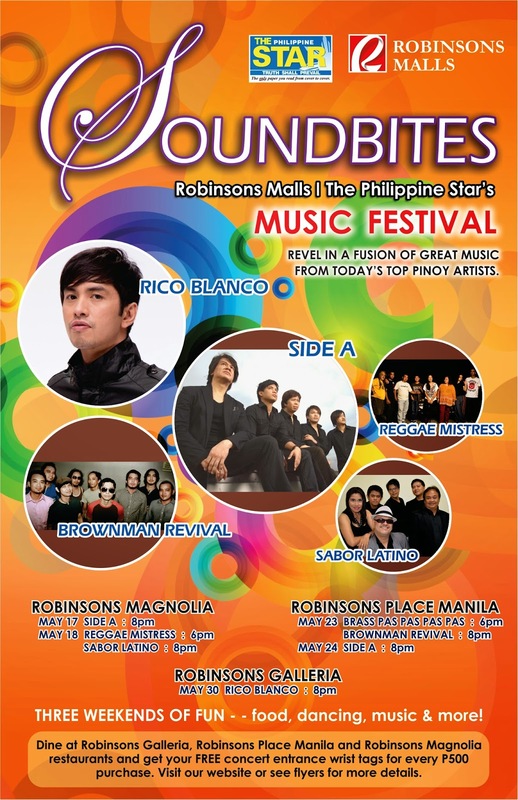 See more of the Robinson's Malls Soundbites pictures. At the end of the show, we (blogger partners) got the chance to have a quick photo opp with the band :) I was surprised to see people lining up too and having their pictures taken. Side A Band was accommodating and nice. There were no security guards manning the stage (or maybe they felt that there was no need to police anyone). Everything seemed so organized! I love the crowd that night! This was one of the most organized events I have attended. Despite the delay because of a sudden rainfall, we all had a great night. Thank you so much Robinson's Mall for the awesome mini-concert! P.S. Robinson's Magnolia is my friend's favorite mall, and now I understand why. We love the warm lighting, spacious alleys and sophisticated architecture. Plus, there is an al-fresco dining and open park where the mini-concert was held! If you missed last night's event (and tonight's), you may catch the other Soundbites shows running in Robinson's Galleria and Robinson's Place Manila. For every Php 500 single receipt purchase, customer is entitled to 1 wrist tag for the concert. You can check out the full mechanics here.